Today we’re joined by the Sony Ericsson Xperia ray to talk about small smartphones. It measures just 9.4mm in thickness and the 3.3″ screen makes for a very compact phone overall. Sony Ericsson didn’t skimp on the resolution though – the screen packs 480 x 854 pixels, which means nearly 300ppi pixel density (the iPhone 4′s Retina display has 326ppi). Aside from low-res screens, small smartphones usually get stuck with an old chipset – that’s not the case with the Xperia ray either. It has a 1GHz CPU and can record 720p video from its 8MP camera. If you go over the specs for the Sony Ericsson Xperia ray and hit Compare, you’ll see that it’s basically the same platform as several other Xperia phones – Arc and Neo for example. So, we don’t expect many surprises here, just a smooth experience overall. The display really is something though – even miniscule text is smooth and readable. And its not just the impressive pixel density either, the mobile Bravia engine ensures a great viewing experience on movies and pictures. Anyway, we’ll cover some of those technical details in the upcoming preview and the rest of them in the review. 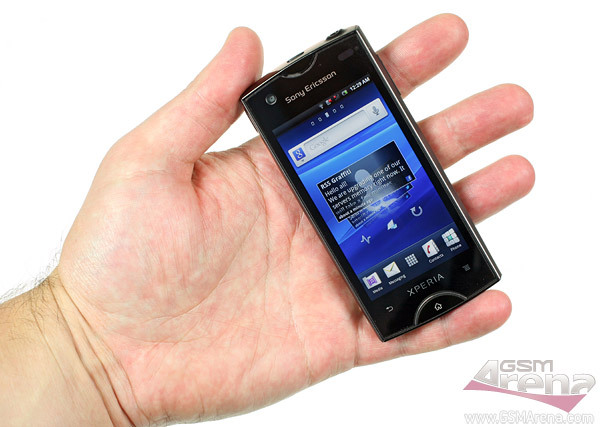 For now, you can enjoy this video of the user interface of the Sony Ericsson Xperia ray. Dimensions in millimeters and photos don’t quite convey just how small the Xperia ray is. That’s a positive thing (yay for compact smartphones) but since the screen has 16:9 aspect, it’s also one of the smallest 3.3″ screens around (3:2 aspect gives more surface area for even 3.2″ screens).